Phavia Kujichagulia is a former Professor of Ethnomusicology & African Civilizations at World College West and Stanford University’s Workshop on Political & Social Issues. In 2002, Sistah Kujichagulia was a member of the United States Delegation to the 2nd World Conference Against Racism (WCAR – Culture & Spirituality Committee) in the Caribbean country of Barbados. She has performed and lectured extensively throughout the continental USA, the Caribbean, and England. In addition to more than ten years as Resident Literary Artist at San Quentin Prison, Phavia Kujichagulia has taught Literary & Performing Arts throughout northern California’s Department of Corrections at DVI, Susanville, Vacaville, Soledad, and Folsom Prisons for more than 16 years. A dedicated educator, she has developed K-12 Language Arts, Cultural Arts, and Social Studies resources for the San Francisco Unified, Oakland Unified, and Kansas City, Missouri Unified School Districts. From 1990 to 1999 Phavia Kujichagulia wrote for Jazz Now Magazine. She currently writes for the San Francisco Examiner Online Newspaper (http://www.examiner.com/ethnic-community-in-oakland/phavia-kujichagulia). In 2012, the San Francisco Bayview Newspaper’s Black Media Appreciation Night (Yoshi’s Oakland) honored Black Journalists and Media Workers in the Bay Area, where Phavia Kujichagulia was named Champion of Black Editorial Writing. Phavia Kujichagulia’s latest book, Recognizing & Resolving the Roots of Racism, is a must-read for those serious about eliminating racism in this lifetime. It is a profoundly insightful analysis of the evolution and evidence of racism embedded within every aspect of American culture. It includes a chronology of history from 4,700,000,000 BCE, an overview of civilization before racism, and a glossary of common words and phrases used daily to reinforce racism and white supremacy from generation to generation. This landmark publication challenges society to analyze the subconscious relationship between vocabulary, beliefs, and behavior. Most of all, Recognizing & Resolving the Roots of Racism offers solutions to cure the social dis-ease of racism. Recognizing & Resolving the Roots of Racism is available on line and can be ordered through any book store [ISBN 978-1-4507-4050-0]. Renaissance woman, Phavia Kujichagulia, is one of the musicians and cultural artists highlighted in the Arcadia Publishing book series, Images of America: Black Artists in Oakland (2007). 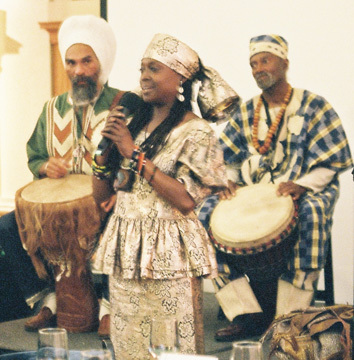 She is a Griot (Djialli Ba) – an oral historian who utilizes music and poetry to reveal history. This spoken word artist plays trumpet/cornet and percussion. She dynamically orchestrates African music, Jazz, and pop into a hypnotic rhapsody. Her performances include the World Drum Festival, National Black Expo, the John Coltrane Festival, and Nelson Mandela’s 1990 USA Tour. Between 1990 and 1999, Phavia Kujichagulia was the cultural director and co-leader of the African Roots of Jazz. Her production piece, RACISM & ALL THAT JAZZ: The Evolution of African-American Classical Music has received national acclaim in the USA.